Raz was invited by Beth de Lange to present a weekend workshop for 35 people. 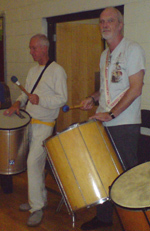 The group consisted mostly of people who were new to percussion and the workshop aims was to generate sufficient interest to launch a new community samba group in Derby. We began with some fun yet challenging body percussion and clapping warm ups which the group really enjoyed. I then presented two grooves, a Samba Reggae and a fusion groove mixing elements of Cuban and Brazilian rhythms for the bateria. and it was a successful first step in getting things started.